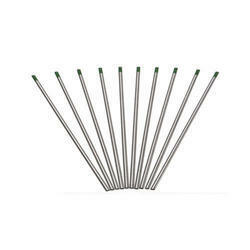 Our product range includes a wide range of stellite electrode 21. Cobaltalloys have higher melting points than nickel (or iron) alloys ,This gives them the ability to absorb stress to a higher absolute temperature. Stellite Electrode 21 alloys give superior hot corrosion resistance to gas turbine atmospheres , this is due to their high chromium content. Stellite alloys show superior thermal fatigue resistance and weldability over nickel alloys.